I’m going to make this post short and sweet, because guys I’m exhausted. I mean like really, really worn-out. My new job, which I love, is really taking a lot out of me, not only mentally but physically as well. I come home every day of the week and all I want to do is jump in the bed and put the world on hold until the next day when I have to do it all over again. And I know that I been absent the last couple of rotations from the group, but this weekend this cake was not going to be passed by. 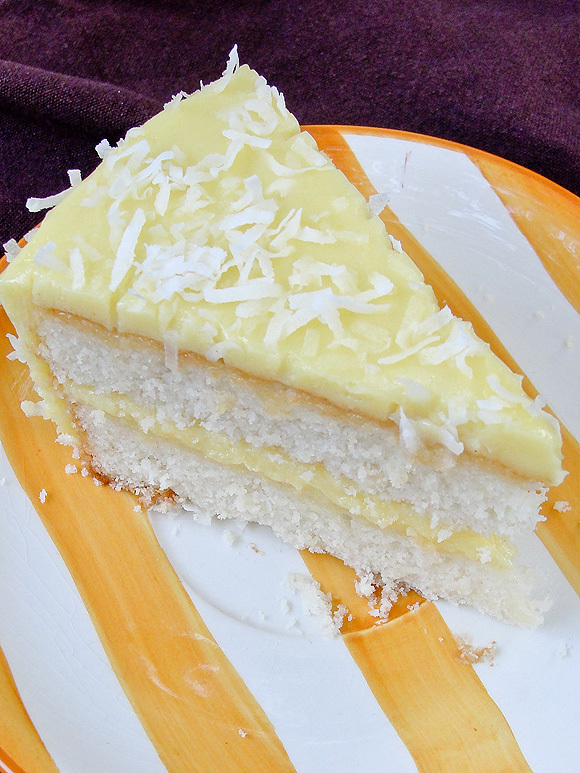 First coconut cake – HELLO is the Holy Grail at my house. Besides my Tres Leches, this is the second “signature cake” that my family is always asking for. I was intrigue in Rose’s take on it, so it was going to be made period. I started late on Saturday night after a full day of running errands all over town. The game plan was to make the cake and then on Sunday finish off with the crème anglaise and the buttercream. As some of you may already have read, the cake comes together pretty fast, since I have a small oven, one that does not fit two 9x2 pans side by side, I decided to take a gamble and bake the cake batter in my 9x3 baking pan, and the rest of the batter in my 6 cupcake pan. It worked like a charm, except of course the cake needed to be in the oven much longer than the 30-40 minute. It actually took almost 55 minutes for the whole thing to cook. The cupcakes much less – about 35 minutes. The other thing that I did differently was to use cream of coconut instead of extract; I did not have time to go on the hunt down for it at our local fresh markets, so I figure that cream of coconut was going to give it a nice punch of coconut flavor. While waiting for the cake to bake, I figure I would do the crème anglaise, since I was reading the recipe and realized that it needed to sit and be cold when it was ready to be used for the buttercream. I got to tell you, I had a moment of doubt here, I made crème anglaise tons of times for my Zuppa Inglese (Italian dessert) so I was pretty comfortable with the steps, what gave me a moment of pause was the fact that you do not use flour as a thicken agent at all. Just eggs yolks, coconut milk, sugar and then vanilla and coconut extract for flavoring. I actually thought it was missing the flour. But, I been baking long enough with the group to give myself the “talk” and just follow the recipe and hope for the best. The end results were not as thick as I thought it was going to be, it was quite running and again I had a moment of doubt, but by this time it was almost midnight and it was time for me to call it a night. Place my cake and the crème in the refrigerator and got to bed. Sunday I started bright and early with the buttercream. Even after all this time most of us approach the buttercream with a bit of unease. Would it work? Would it not? Is the room too hot? Too cold? This is what goes on in our minds as cake bakers – because, none of us had not had a miss on buttercream making. I made sure that everything was at room temperature, my house was pretty cold that day, mainly because it was a beautiful sunny Florida day out side, almost hitting the high 80’s (we were off to the beach later in the afternoon) and I knew that buttercream was a bit tad temperamental when it came to weather. The Italian meringue came together without a hitch. Then it was time to gather all the components and crack up the kitchen aid. I whipped the butter up, added the almost runny crème anglaise (still doubtful here, I was sure it needed to be thicker) then the Italian meringue and whipped. Luckly my buttercream was on my side and it was smooth and creamy. I did not add the CocoRibe or the grated coconut. 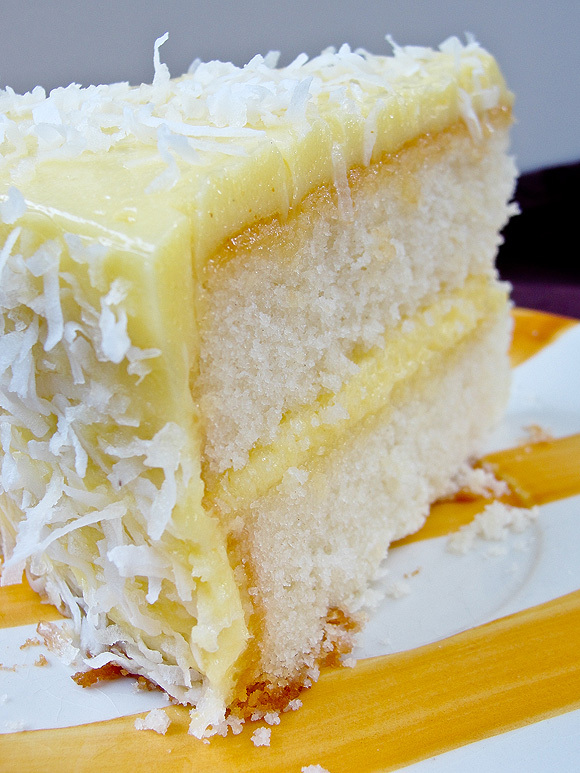 I then frosted as fast as I could and covered the whole thing with grated coconut flakes. Then I stuck it in the refrigerator and a big great note – “YOU DO NOT TOUCH CAKE – OR DIE” Since I knew we were going to be coming back way to late from the beach for me to have any light to photograph the cake and it was not going to get done until Monday afternoon. I think it was the right call too. The cake had its time to get all the flavors together and deepen the taste of the coconut. Tom: “Oh geez, I knew it was going to be good, when I tasted the unfrosted cupcakes on Saturday night, but with the buttercream it just elevates it. I wish it had a deeper coconut flavor, it’s not like your cake, but it’s high up there”. I really liked it. 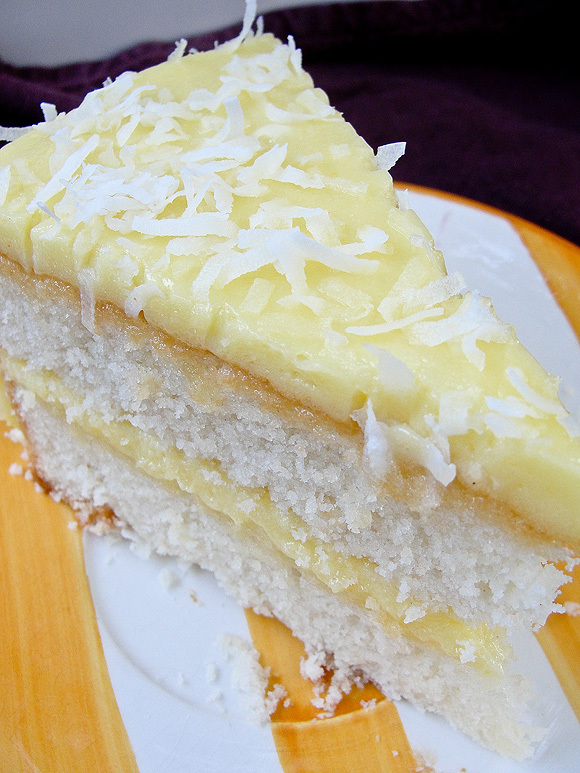 The cake was moist, the buttercream just the right amount not making it super sweet, like most coconut cakes tend to be. I was a bit on the fence with the cake, since it’s light – a result of using only egg whites in the batter. Like you all know I tend to like dense cakes. But, I cannot say that I would not make it again – because I totally could. We are almost finish with baking our way through Rose’s Heavely Cake book, but some of us like me, that have still yet some cakes left here and there, will continue until we are totally done. You can always check out the other HBC baker progress by visiting Heavenly Cake Baker.